Hello, my stampin' sistahs! It's Deborah here, welcoming you back to the Hampton Art blog! Today's trendy little card features Jillibean Soup's Cool as a Cucumber patterned paper collection and a Hampton Art stamp you can find at Michaels. Cut and adhere a 4” x 5.5” white panel. Stamp border of stars down right side. Cut and adhere three squares of 2” x 2” patterned paper. Adhere printed die-cut with dimensional tape. Color clear gems with Copic marker and adhere in center of stars and in upper-left corners of square panels. Don't waste money and storage on buying lots of colored gems. Buy clear gems and color them with Copic or Sharpies. Both markers work great, and you get a perfect match every time! 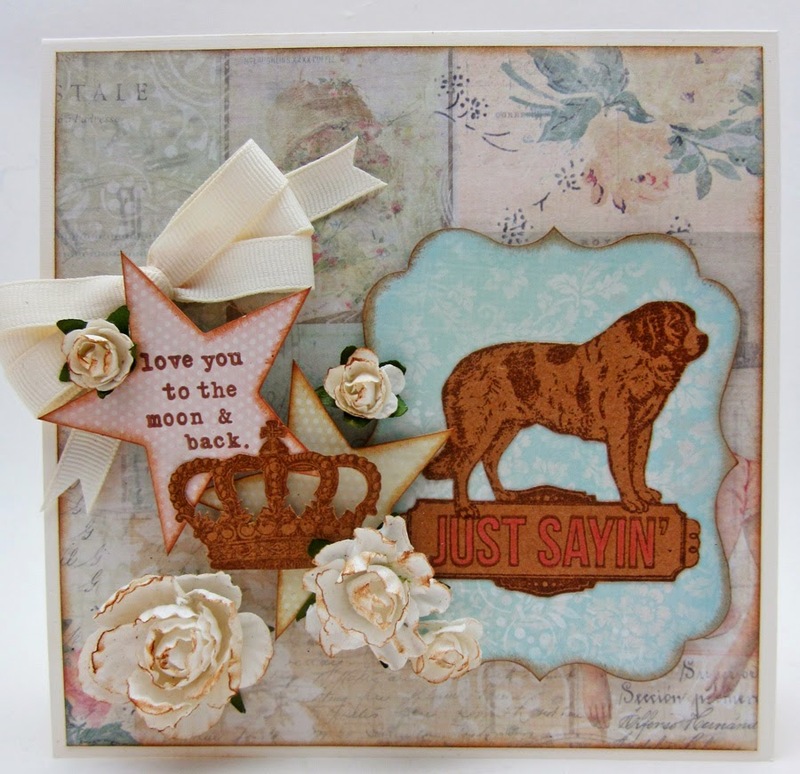 Hi Crafters, it's Lori and today I have a retro card featuring the stamps from the Graphic 45 collections: Come Away with Me and Raining Cats and Dogs. One of my most favorite go to stamps is from the Raining Cats and Dogs #3...it's the little scroll flourish and it's such a great way to add that extra little detail around a sentiment or center piece. It's just simple and so pretty. The sentiment itself is from the Come Away with Me 3 stamp set and I really like the way the font is open in the middle. This left me room to go in a add some coordinating color to my sentiment and honestly I don't think it even looks like it was stamped...LOVE IT!!!! I added some little handmade flowers to the card along with some sewing machine stitching which is something I love to do to my cards..it's that added detail. 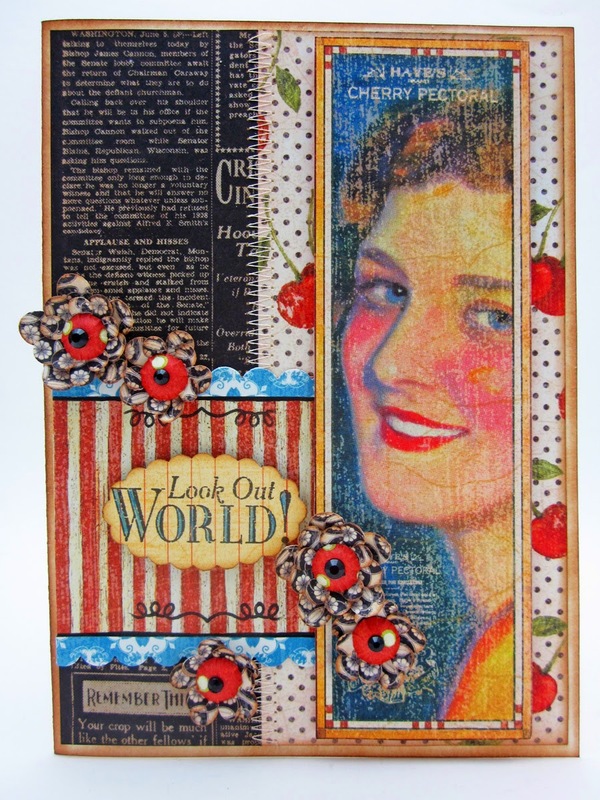 With the right paper and the right stamps (Hampton Art) you can pull off one of kind beauties in no time. Welcome back to the Hampton Art blog! 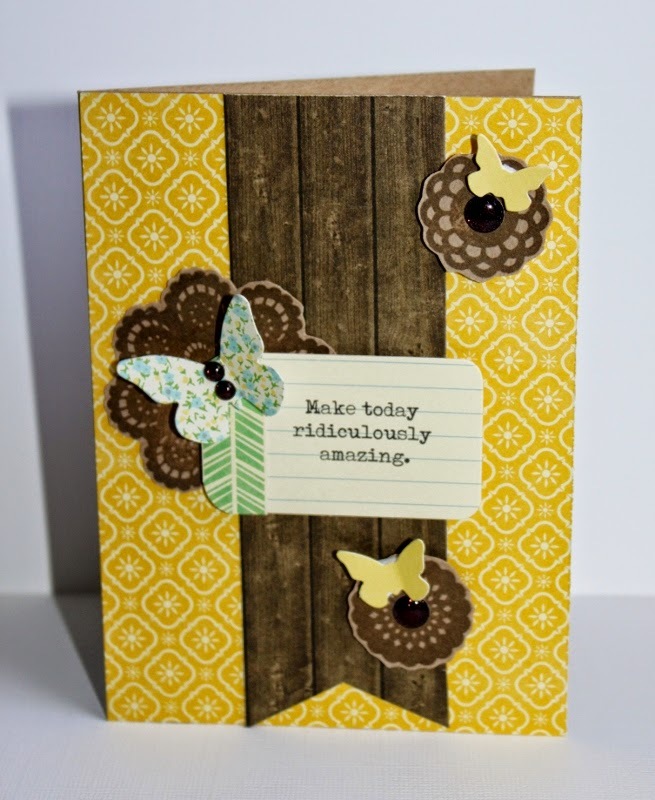 Today I'm sharing two cards using the Cool As A Cucumber Soup line from Jillibean Soup and Hampton Art. I doubled up the foam tape on the back of the guitar on this first card. It helps give the image more dimension. I also used a single layer of foam tape on the greeting. I also doubled up the foam tape on the back of the bike on this second card. Just in case you have a friend or family member that needs to be reminded that they are “now officially old”, and who doesn’t? A playful card is just the ticket with a bright color scheme and Hampton Art/Laugh Out Loud and Vintologie stamped images. Working with a black card base I began with a mat from Holly Berry Borscht/Bite Size Bits “b” side red polka dots. Next using red ink I stamped arrows image onto Soup Staples III/Kraft Triangles paper as shown and corner rounded the mat before adding with 3D foam dots to the card front. Next I added one of the new File Cards from the Soup Staples III sides collection. 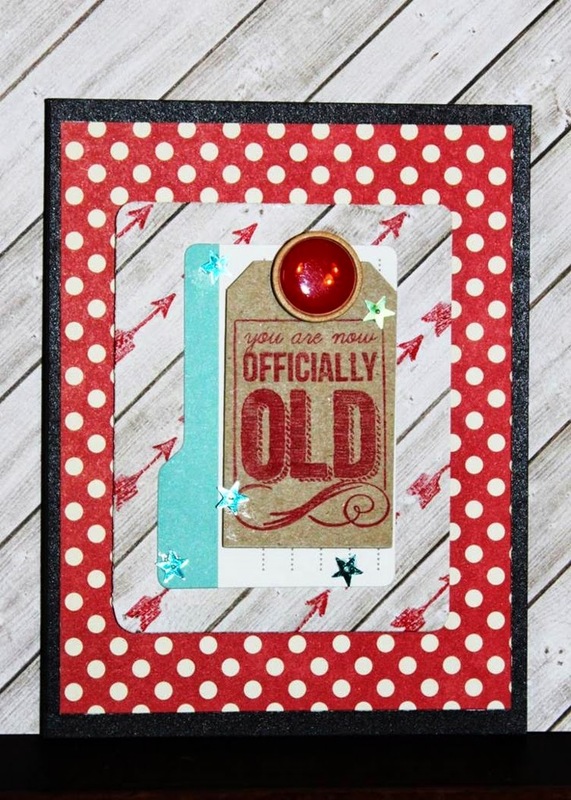 Then using red ink I stamped the “Officially Old” sentiment onto one of the kraft tags. A wood sprinkle in red enamel was added to the top of the tag and then they were attached to the file card as shown. For just a touch of bling I added five turquoise sequin stars from the Holly Berry Borscht collection. Now you have a humorous card to share with your older friends or family. 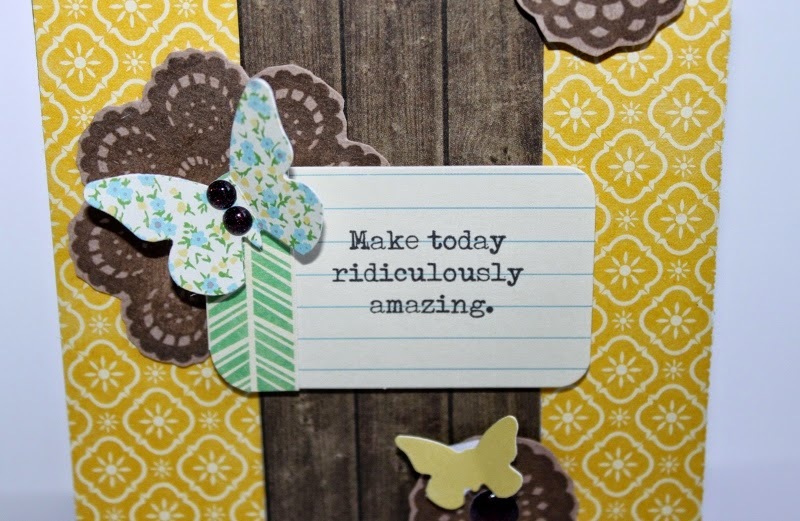 Today I have a girly-girl card to share with you. It just seems that perfume bottles and lavender are just meant to be together! I combined papers from Graphic 45 along with their Perfume stamp set for this sweet little note card. I stamped the perfume bottle in black and fussy cut the image. Then I stamped the "memories" label on the bottle with purple ink. I used foam dots to attach it to the card to add some height. Today's card features a sentiment stamp and patterned paper from Jillibean Soup as well as a little bit of embossing paste action! 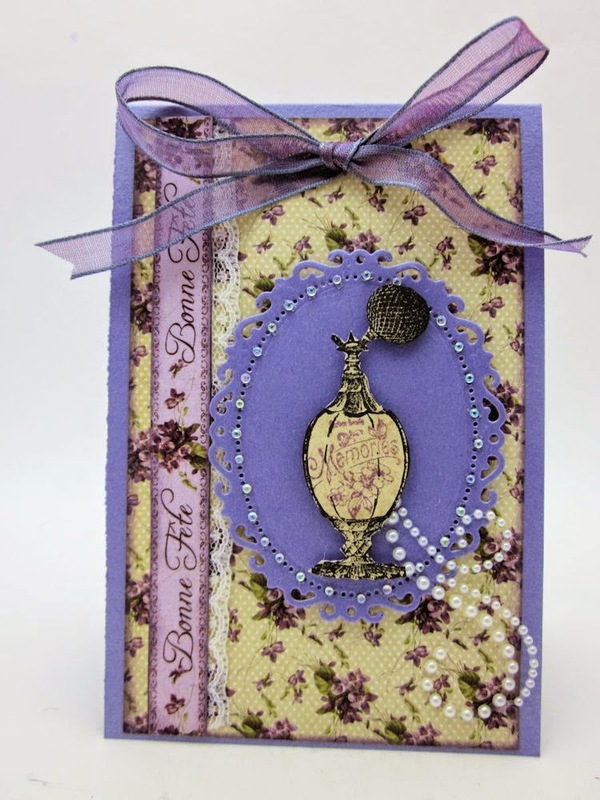 Make card base for a 4.25” x 5.5” card and round opposite corners. Apply embossing paste with trowel over stencil and let dry. 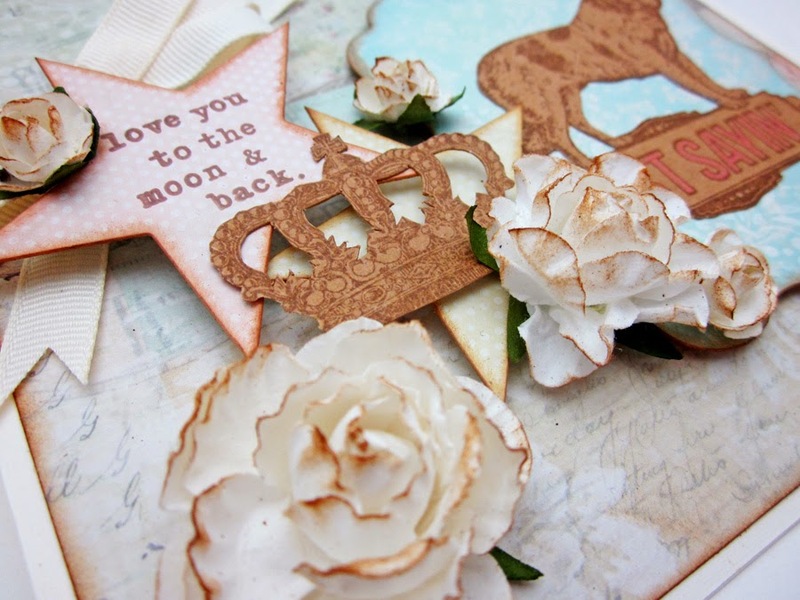 Once embossing paste has dried, cut a panel of patterned paper and adhere. Cut strip of icon images; tie twine around, tie bow and secure with glue dot. Adhere icon element strip with dimensional tape. Adhere wood accent with Diamond Glaze over bow's center. Thread button and adhere in center of wood accent with glue dot. Make sure you wash your stencil and trowel immediately after use. Otherwise, it will dry and damage your stencil. 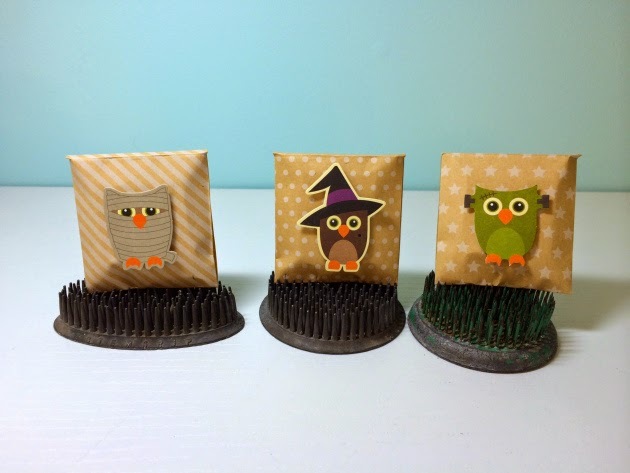 If you haven't played with embossing paste yet, you need to remedy that ASAP! As Martha would say, It's a good thing. Here is a “sweet” card created with its own magic wand, suitable for a tween girl, small girl’s Birthday or baby shower card. This card came together with JIllibean’s newest papers and embellishments from the Soup Staples III collection and a fun Vintologie stamp and stencil set. First I created the card base from Soup Staples III/Graph It paper. Next I chose a Notebook Tag from the Everyday pack and stamped the Vintologie sentiment in black ink. Then, I grabbed the chevron stencil out of the Vintologie stamp and stencil pack. Using white pigment ink I inked up the stencil onto plain kraft paper and set aside to dry. Then I chose two of the new kraft tags from the Soup Staples Sides collection and used the Soup Staples/Kraft Triangles as a backer for the “Sweet” tag and some Holly Berry Borscht/3 Cups of Presents for the “star cutout” tag backer. The next step was to fussy cut two strips from the stenciled chevrons into arrows as shown. Then I arranged the tags onto the card front as shown with a piece of the Soup Staples/Read Me in the center. Last I corner rounded the bottom corners and added the star stick pin and white cotton string double bow. There you have it, a precious card to share with that special little one in your life. 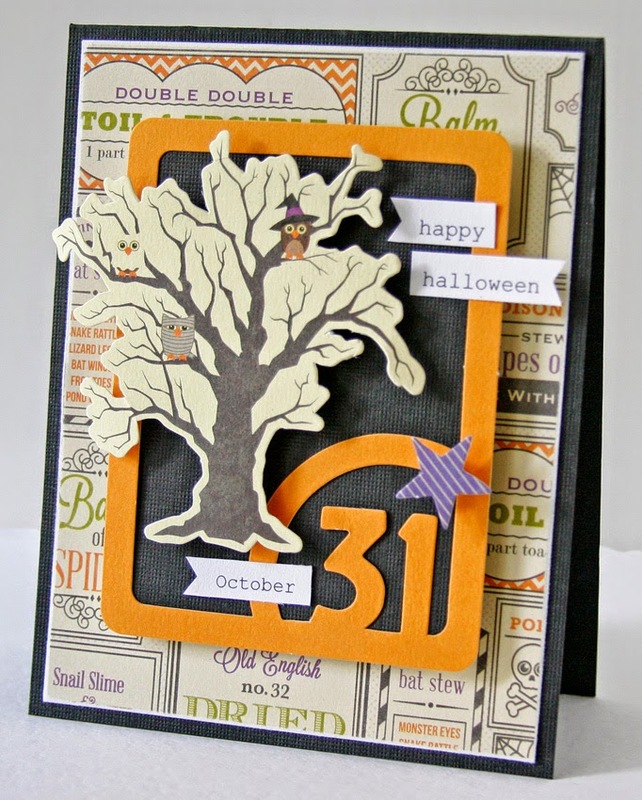 Today I have 3 Halloween cards featured in the latest CardMaker Magazine newsletter. 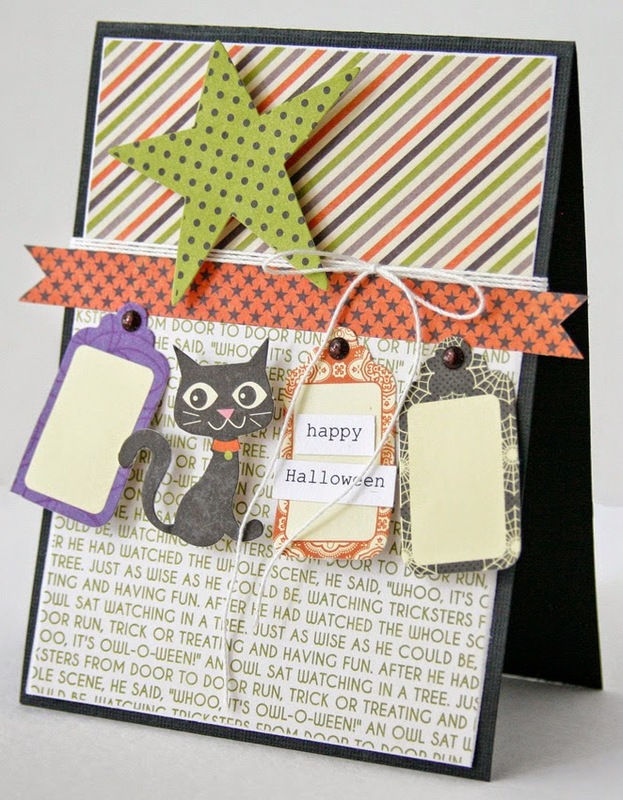 All these cards were created using the Jillibean Soup Witches Brew Halloween line. 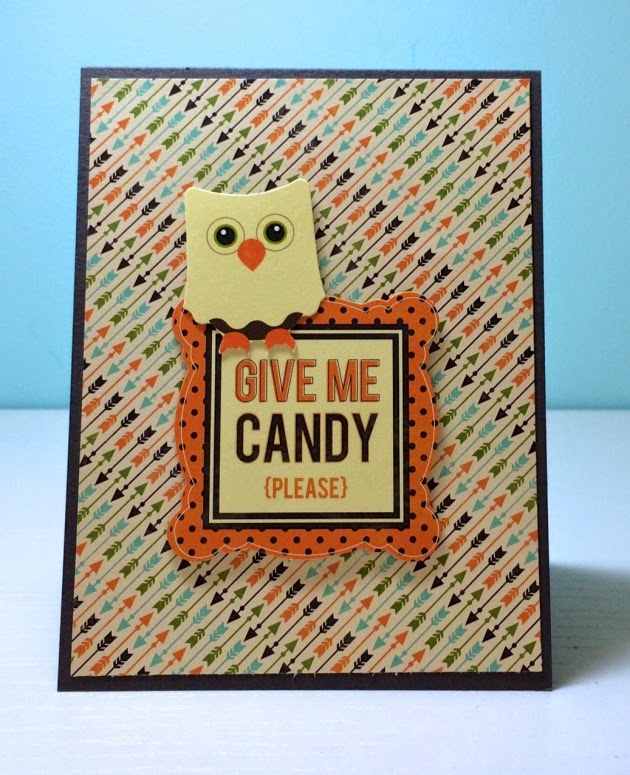 In the full newsletter, I have instructions on how to the create the 'Give Me Candy' card. All of these are great cards to give to a neighbor, family or friend. Perfect for this time of year! Hey, there, Stampers! 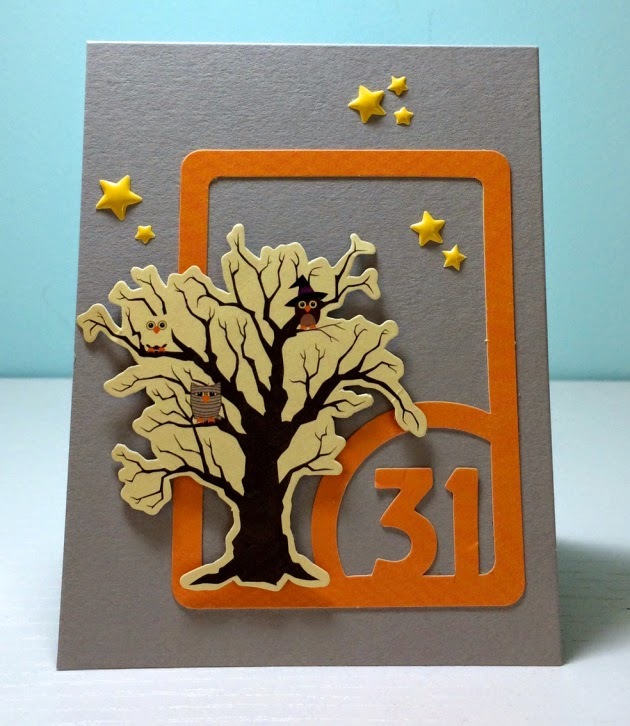 It's Deborah again with a Halloween card that I hope will rev up your creative engines! 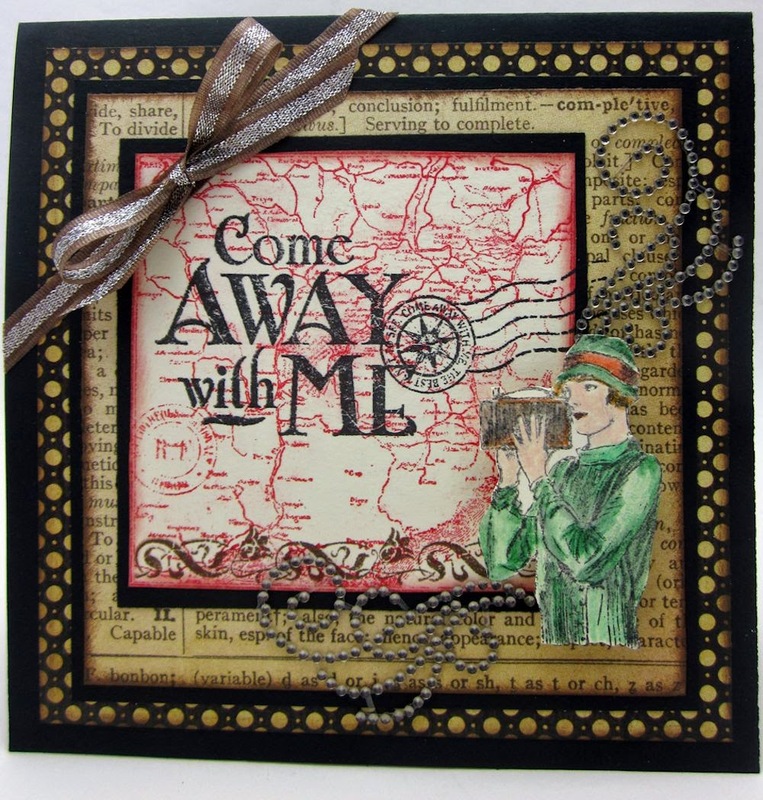 Today's card features patterned paper and a coordinating sentiment stamp from Graphic 45's Steampunk Spells collection. Make card base for a 4.25” x 5.5” card and round bottom corners. Die cut and adhere patterned paper. 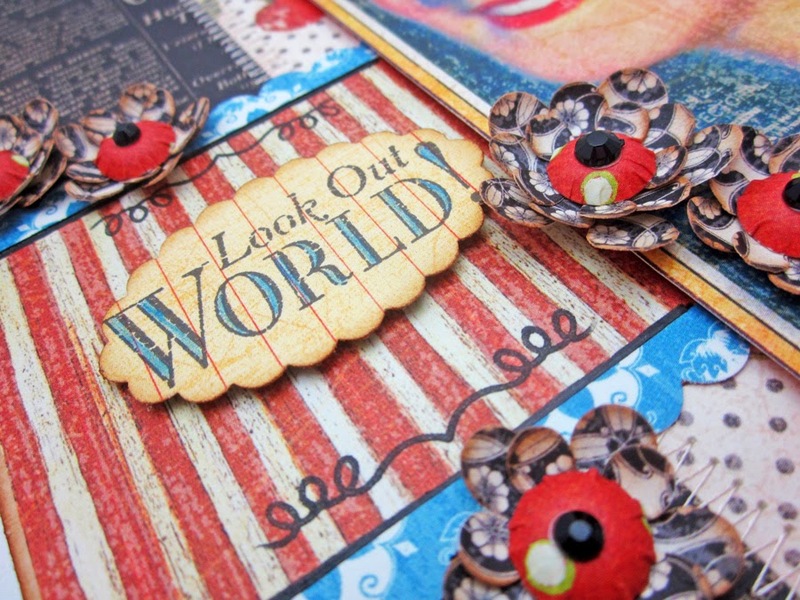 Die cut circle and stamp sentiment; set aside to dry or heat-set. Apply three rows of gold glitter tape to cardstock scrap and die cut Stars & Hearts three times. Adhere gold stars as desired on card; follow by adhering gems in star centers. Apply five rows of black glitter tape to cardstock scrap and die cut Blessed Stars. 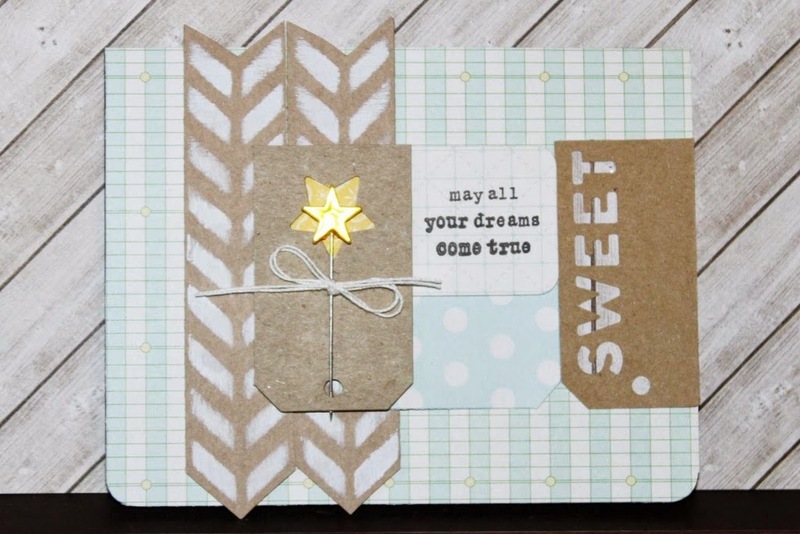 Snip bow off of Blessed Stars die-cut and set aside. Place top of Blessed Stars tendrils die-cut to card in area of stamped circle and adhere by wrapping gold glitter tape around card front. Apply a 5" length of black glitter tape to scrap cardstock, cut a 1/4" strip length-wise, and adhere strip to center of gold tape; trim ends flush with card. Adhere die-cut circle with foam dimensional tape to cover tops of tendrils. Adhere Blessed Stars bow to stamped circle. If you don't have any glittery cardstock for die cutting, make some by applying rows of glittery washi tape to scrap cardstock. Make sure your rows abutt one another precisely - no overlap or spaces between. Die cut as usual and voila! You have fancy-pants glittery goodness that nobody will ever suspect is a tape-covered scrap of cardstock. Hi everyone, Lori here with you today and I've got some Steampunk magic up my sleeve for you. I love the eerie side of Halloween...not the gory side just the retro cool side. 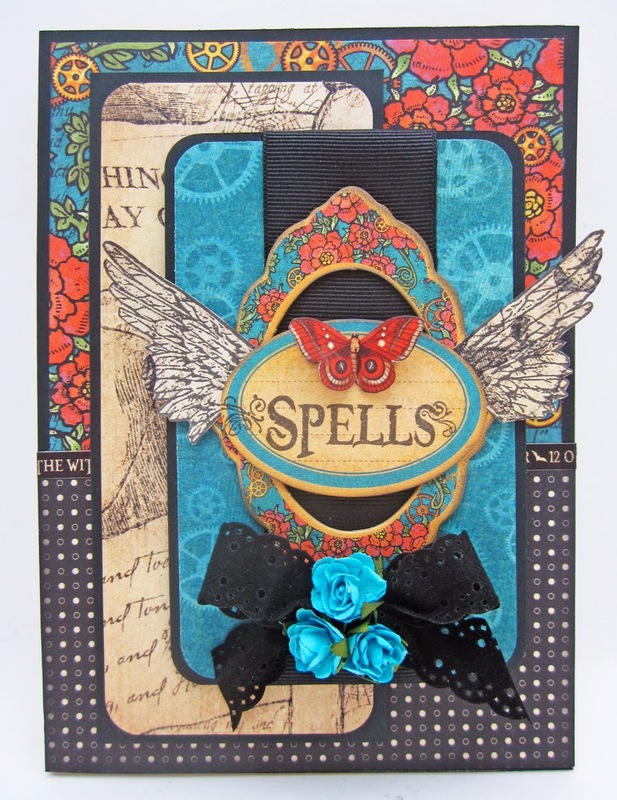 So I thought I would create a spellbinding card for you and I was able to pull it off with the help of the Graphic 45 Steampunk Spells paper and coordinating stamp sets. I like to layer all my paper pieces with solid backgrounds that give an edge. This really helps each of the paper pieces to pop and stand out on their own. 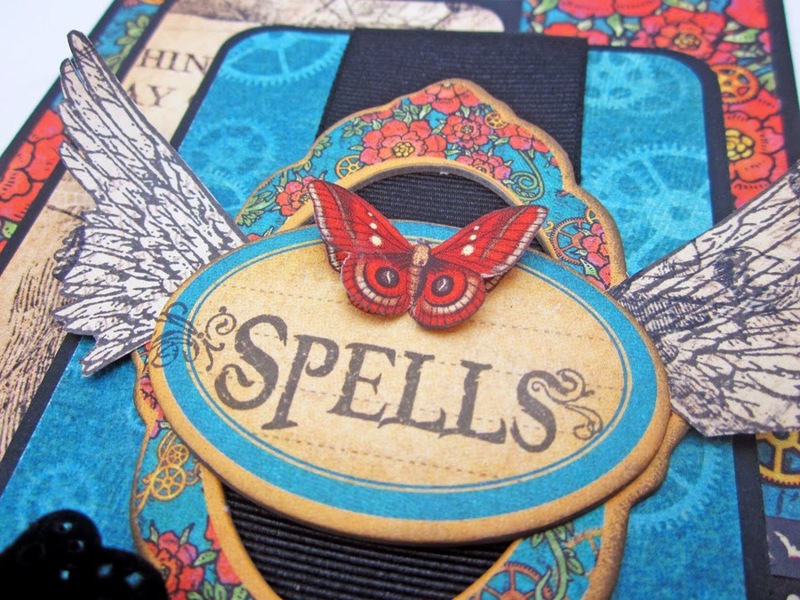 I stamped the Spells stamp on a piece of chipboard and then stamped the wings. I then fussy cut the wings out and curled them a bit before adding them to the back of my center sentiment. I love the way the wings and the butterfly really look like they are going to take off in flight. The colors in this collection also really stand out and make such a bold statement...I love it. Hello and welcome back to the Hampton Art blog! 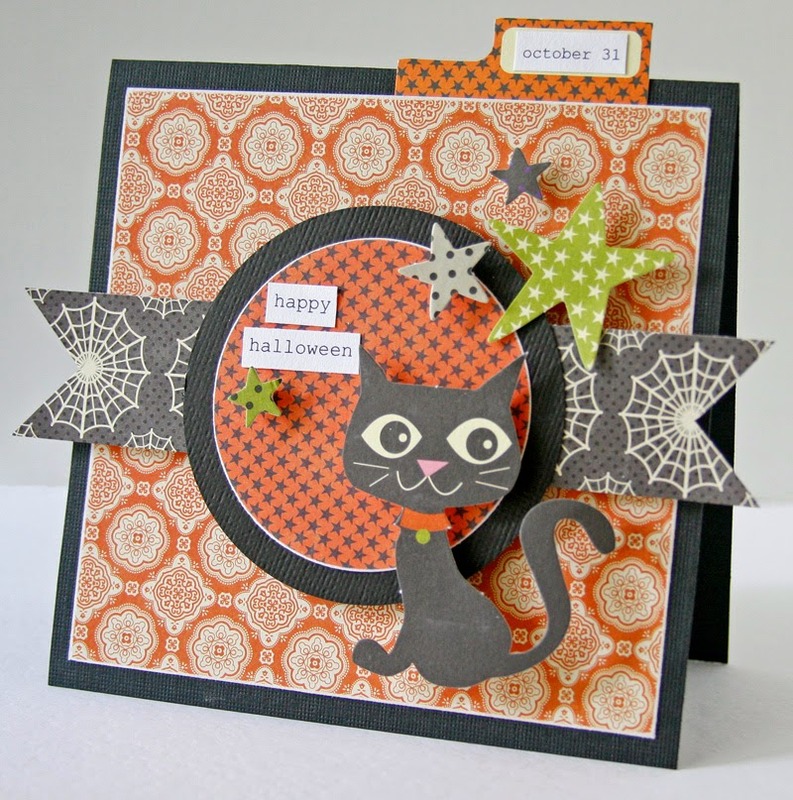 It's Deborah here with a Halloween card for my fellow cat lovers! Today's card features 6" x 6" Witches Brew patterned paper and enamel stars from Jillibean Soup and Hampton Art stamps you can find at Michaels. Cut and adhere 4.25” x 5.5” panel of patterned paper. Stamp images on white card panel, color, and adhere. Adhere gems and enamel dots. When you color a cat, don't just go for one color! It's very easy to throw some stripes in there, and it's so much cuter! Hi! It’s October and Halloween is just around the corner. 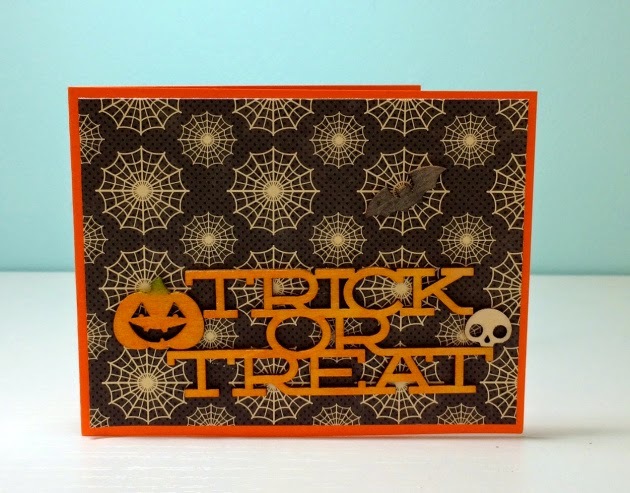 So I’ve got a couple of Halloween-themed cards to share today! To make these I started with black cardstock as the base of the cards. The patterned paper is from the Jillibean Soup “Owloween Stew” and “Witches Brew” 6x6 paper pads. 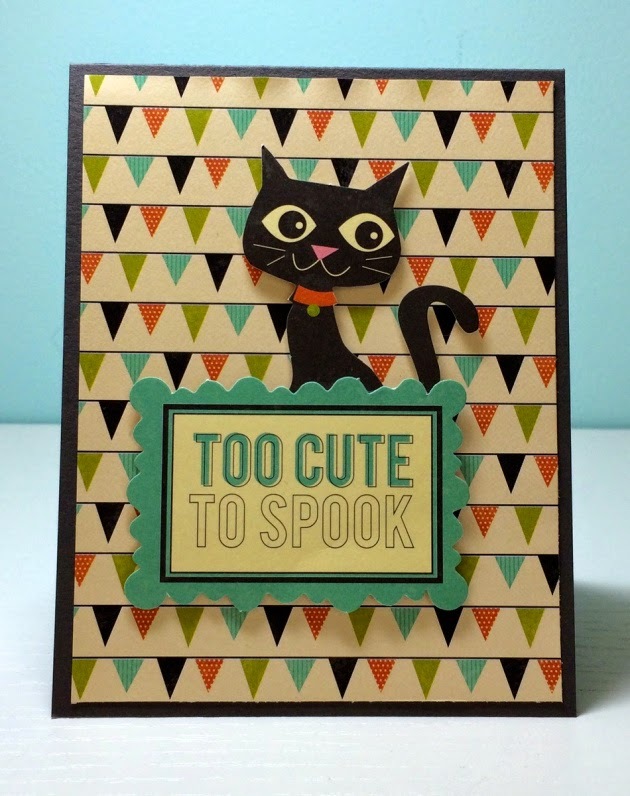 Then I used a bunch of fun die cuts (isn’t this cat so cute?!) and the “31” mini placemat to embellish the cards. I used lot of foam adhesive to adhere the die cuts to give the cards some fun dimension. Thanks for looking and happy Halloween! 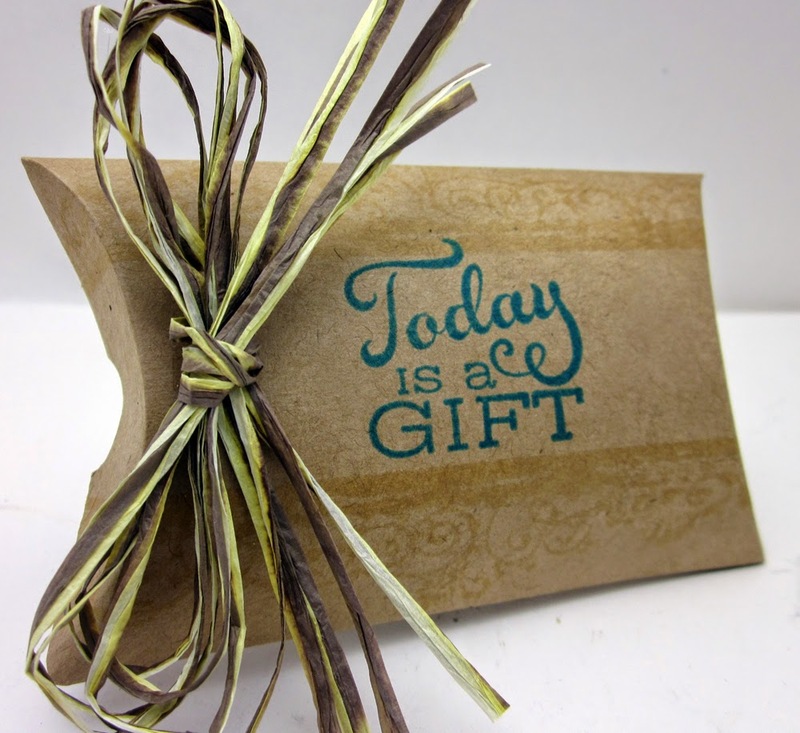 It's always a good thing to have creative ideas for hostess gifts tucked away when you need one! 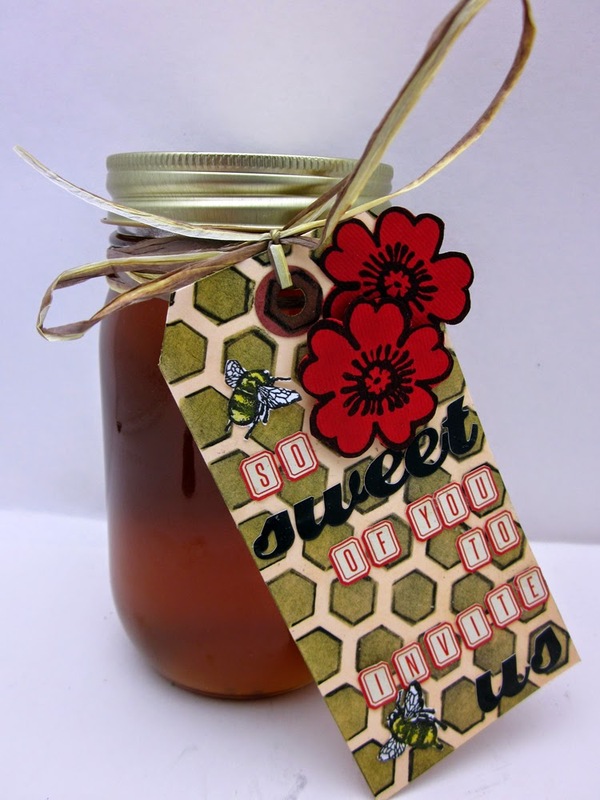 Local honey is plentiful now, so I decided to create a tag to go with this sweet gift. Pillow boxes are such a sweet way to wrap a little goody - and Jillibean Soup has great little kraft paper ones, that are just waiting to be embellished. I really like the natural look of the kraft, so I wanted to stay with that look - so after I stamped my sentiment and the flourishes on the box, I just added a little paper raffia bow to finish it up. Welcome back to the Hampton Arts blog! 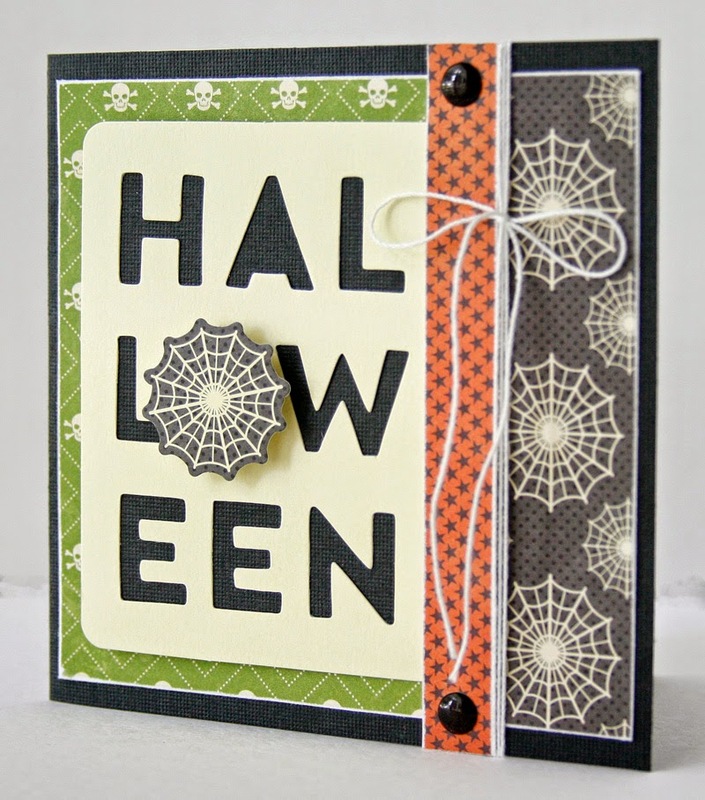 Today I have two cute Halloween cards featuring Jillibean Soup / Hampton Art products. This card is one that just has a shabby soft feel to me. 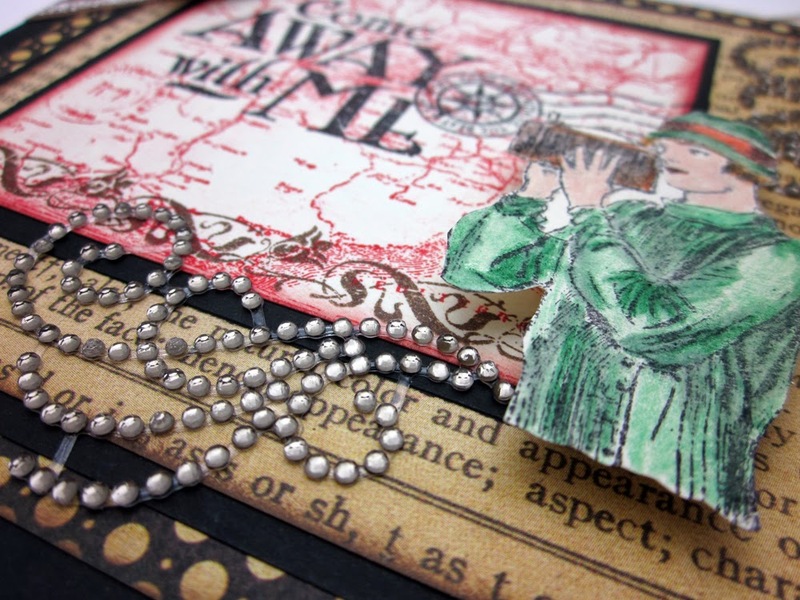 I used a mix of stamp sets on this card to help me create the main cluster of images. I think my favorite is the crown (PS0769 7 Gypsies) I stamped it on Kraft paper and then fussy cut it out. It makes it’s own little embellishment and adds a lot to the cluster. I had the star die cut so I stamped the sentiment ( SC0645) on that and then nestled it all in amongst another star, flowers and ribbon. The dog stamp is from the Raining Cats and Dog’s series from G45/Hampton Art ( IC0314) …and I’m a sucker for a Saint Bernard. I stamped him on Kraft paper and the fussy cut him out and adhered him to a tag. I stamped the sentiment on the bottom of the dog and colored in with colored pencil for just a pop of color. It’s such a wide range of images but when it’s clustered all together it comes together to create a sweet card. 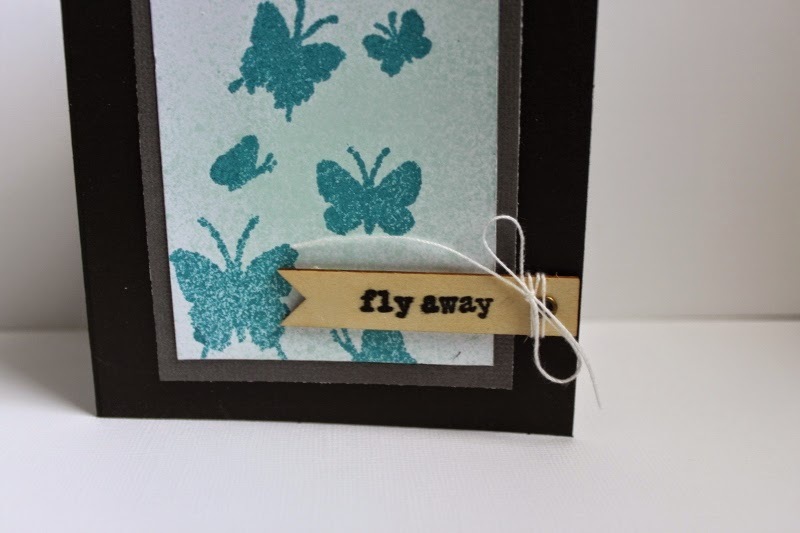 Today I am sharing a card created with the new Jillibean Soup Stamp & Stencil Set Butterfly Dictionary and spray mists. First I selected heavy paper suitable for misting and placed down my butterfly stencil. Then I sprayed the mist over the stencil. Next I removed the stencil and sprayed a contrasting mist color to add depth. Then I set that aside to dry and made a dark grey mat from cardstock. 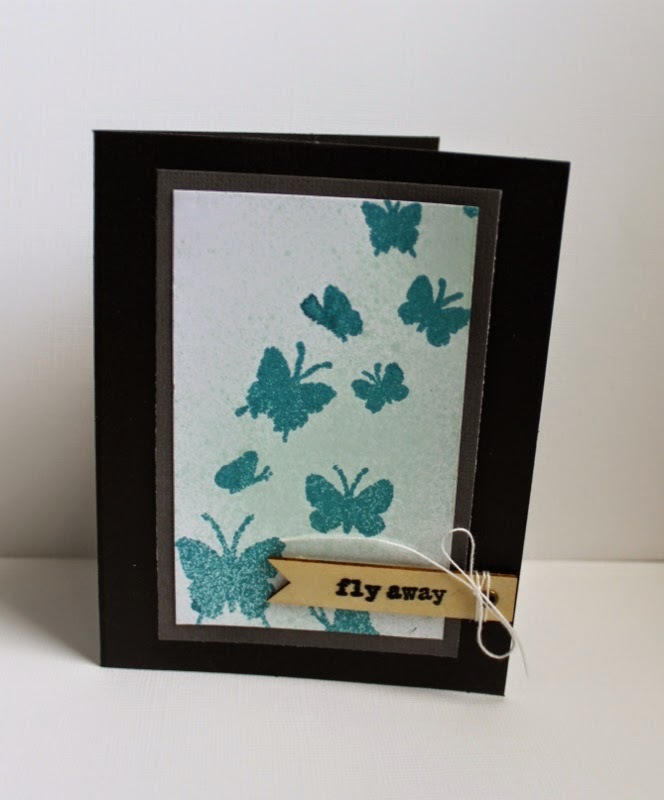 Then I chose a “fly away” sentiment from the Vintologie Stamp & Stencil set to complement the design and stamped in black onto the wood flag. I also added some thin cotton twine and tied in a knot around the wood flag. Last it was all added to a black cardstock base, to keep the panel the focus. Thanks for joining me on the Hampton Arts blog! 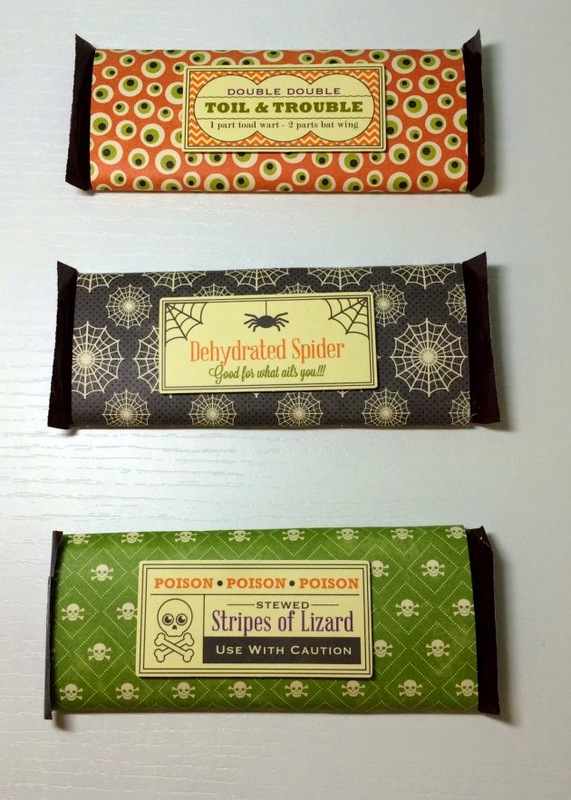 Today I have some fun candy treats featuring Jillibean Soup / Hampton Art products. Who says Christmas themed paper can’t be used for an everyday card? Not me, because clearly the example below if proof to the contrary. A fun everyday card created from the new Holly Berry Borscht collection from Jillibean Soup, paired up with a new stamp and stencil set- together they are simply delightful! I started by stamping the doilies onto kraft paper in brown ink and fussy cutting them out. Then I covered the card base in 3 Cups Presents from the Holly Berry Borscht collection, with the center banner cut from Pinch of Peppermint. Next I added the doilies with 3D foam dots for added dimension. Then I chose one of the new Jillibean Soup note cards for the perfect sentiment. I added the paper strip to the edge and added to the card. Then I chose some diecut butterflies for enhancement and attached as shown. Make your ridiculously amazing card soon and share it with your own real life super hero. It's Deborah here with another card! Today's card features Birthday Bisque products from Jillibean Soup. This is one of my favorite collections because I love the color palette and light-hearted feel of the images. Although I created this for my niece's birthday, it could also be used for any sort of anniversary or other celebratory event. Cut three strips of PP in graduating heights and adhere to card front. Dry emboss panel of brown cardstock, apply ink, ribbon-cut end, and adhere using foam dimensional tape. Cut strip of PP #4, ribbon-cut end, and adhere using foam dimensional tape. Adhere sentiment die cut shape and star sticker. Thanks for joining me on the Hampton Arts blog! 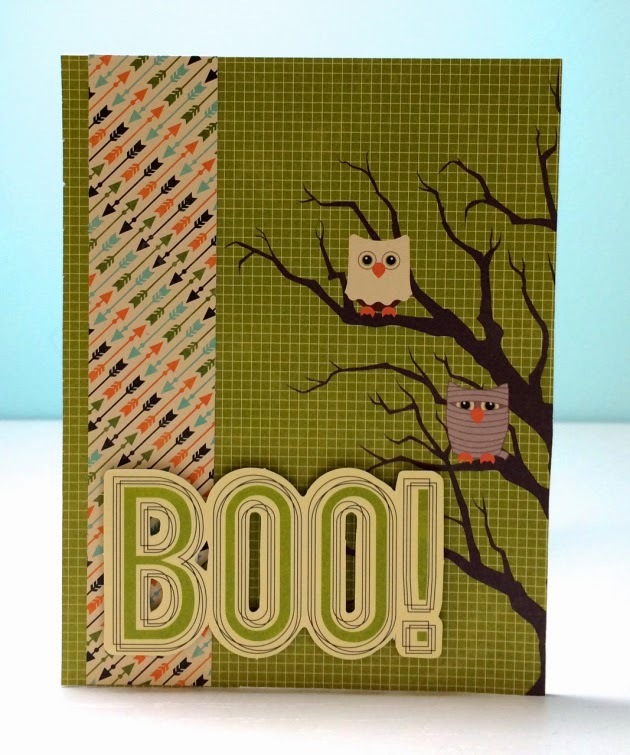 Today I have a fun Halloween card featuring wood veneer shapes by Jillibean Soup / Hampton Art. The Halloween wood veneer package includes stars, bats, jack-o-lanterns and spooky skulls. I thought it would be fun to color them with Distress Inks and Stains. Thanks for joining me on the Hampton Arts blog! Today I have a two Halloween cards featuring Jillibean Soup / Hampton Art. Masculine cards seems to be a challenge for a lot of paper crafters. The good news is the Good Ol’ Sport Stamps really help to make a great card. My main image was stamped and then colored in with colored pencils. 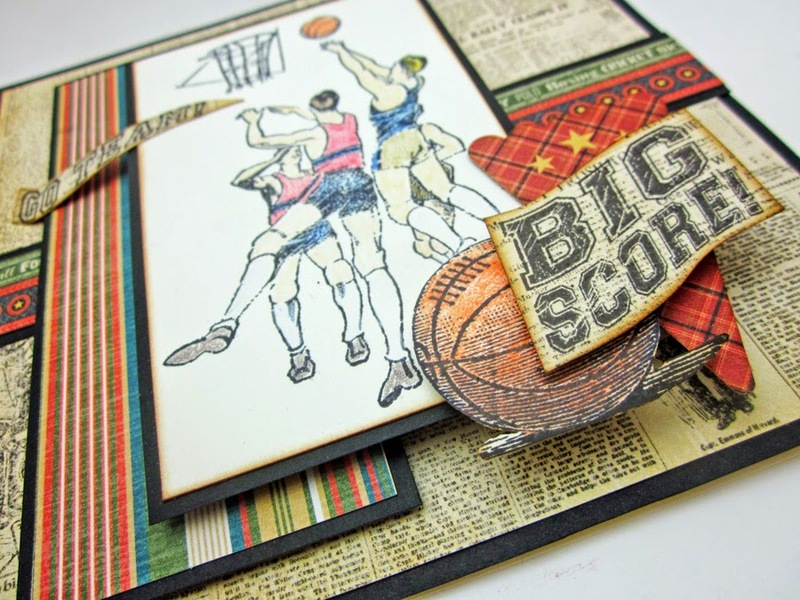 The “Go Team” banner along with the “Big Score” banner were both stamped on patterned paper from Graphic 45’s Good Ol’ Sport paper collection and then cut out by hand in the shapes. 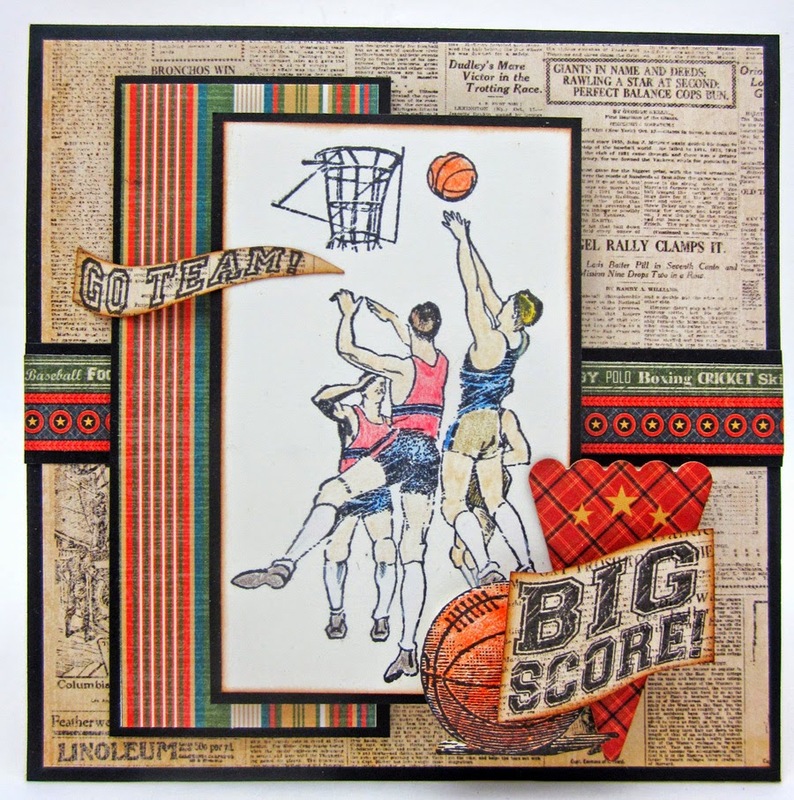 I also stamped the basketball and colored in then fussy cut it out to add into my little cluster in the bottom right hand corner. All of my papers were backed on black cardstock for two reasons, first I wanted to add some stability to the over all build up and the second was the black really made each piece pop. Foam tape was the hero that helped me pull this dimensional beauty together. I do love me some foam tape. G45 Good Ol’ Sport IC0300 and IC0301.